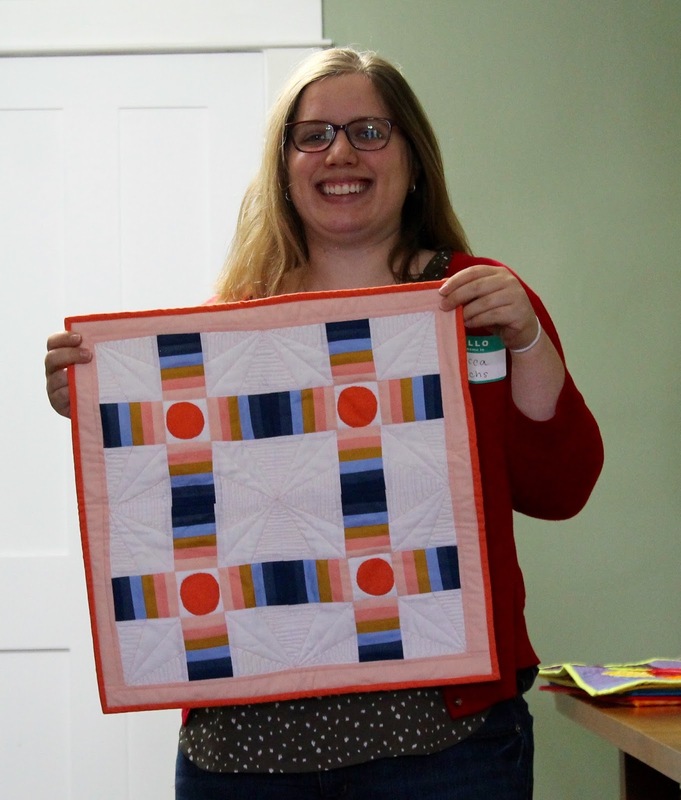 It was great to see you all at our April meeting - many thanks to Rebecca for hosting us at her lovely home. 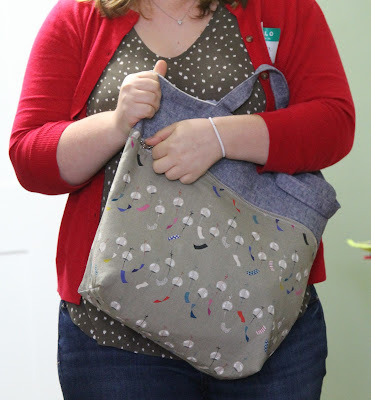 We know many of you made out well at the fabric swap and we can't wait to see what you do with your new scraps and fat quarters! 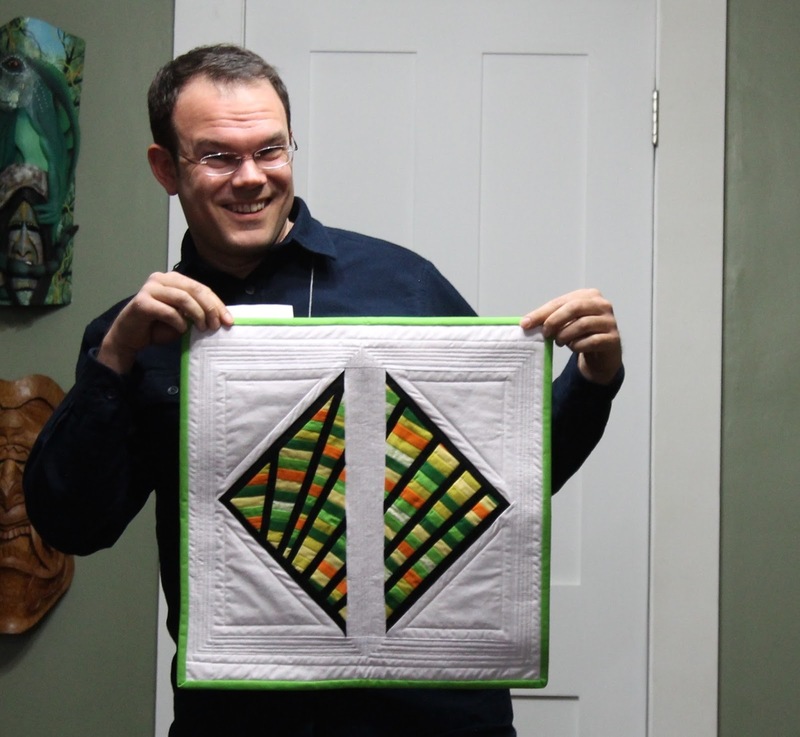 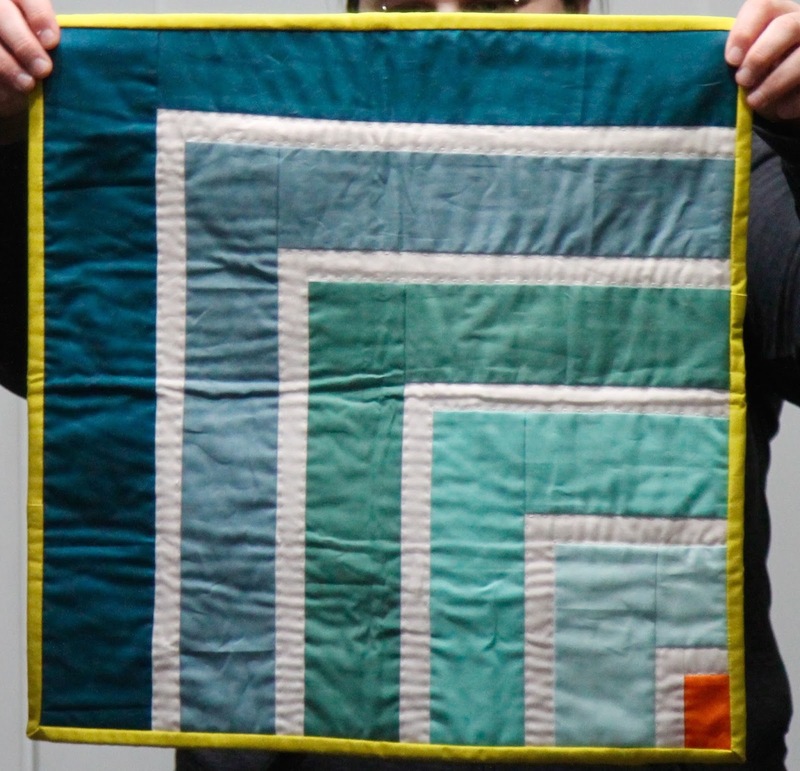 We got a great preview of our quilt show (Gather Here, THIS WEEKEND) since submissions were due. 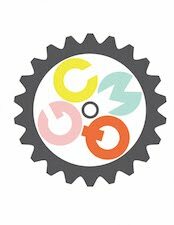 So here's a sneak peek if you missed the meeting! 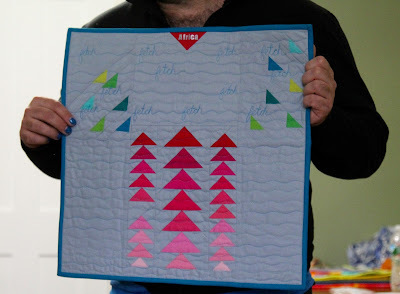 T's sooo fetch Mean Girls inspired mini. 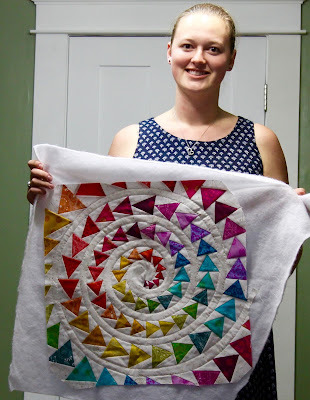 Carolyn's bursting mini Mariner's Compass urges us to just keep going! 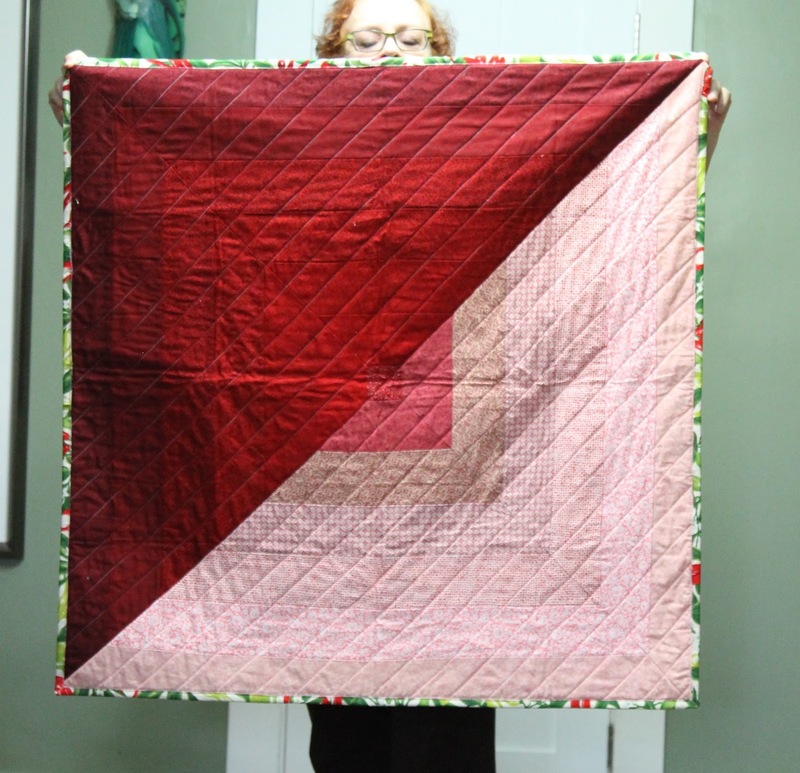 and her lovely kiss quilt, quilted on a domestic! 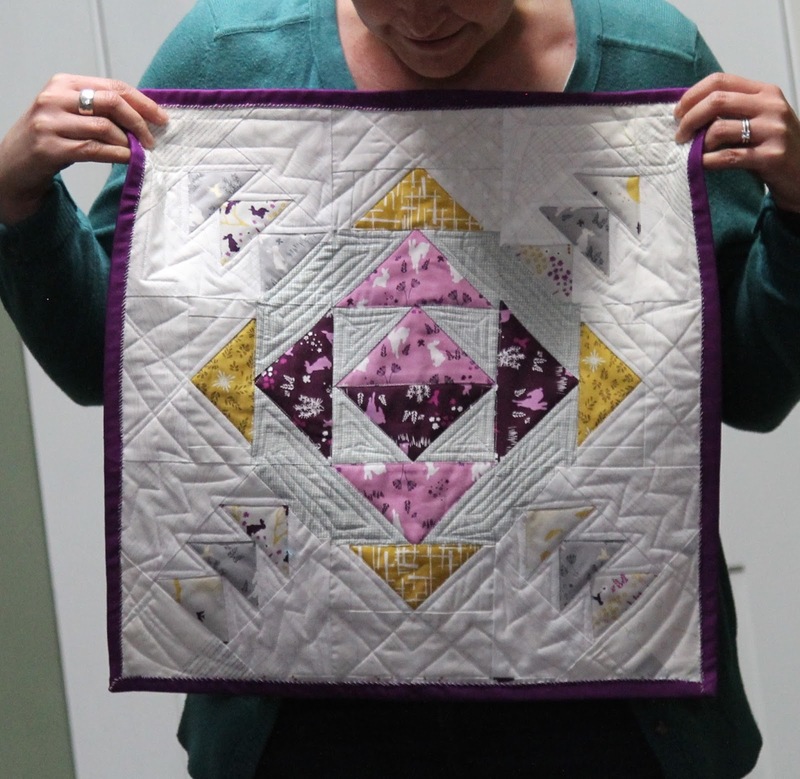 Hildy's wonky disappearing 9 patch, made AFTER her machine died at retreat! 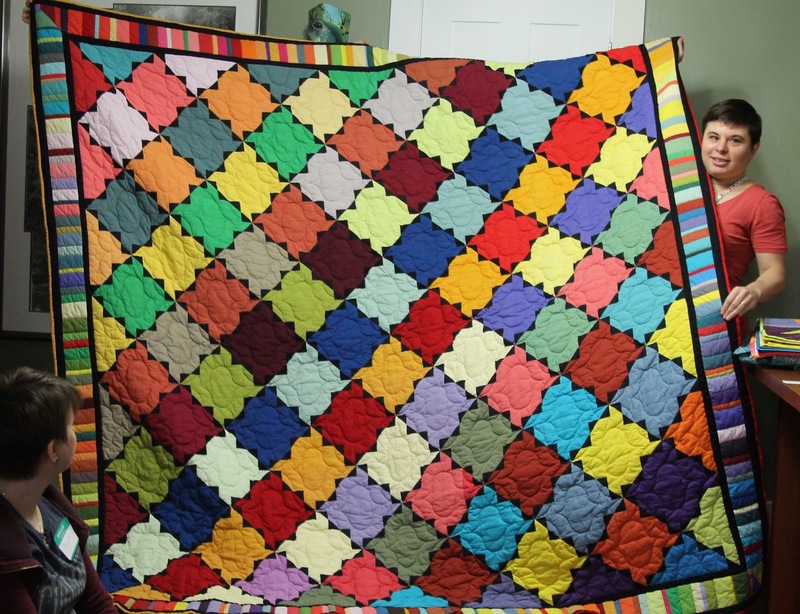 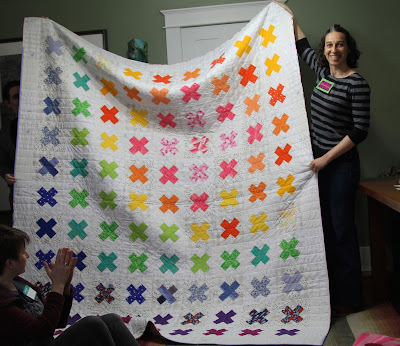 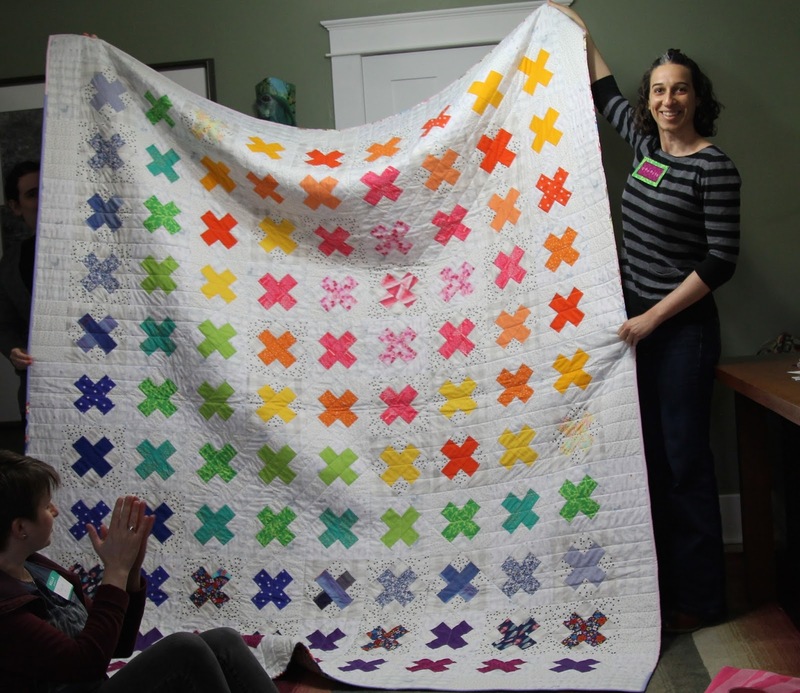 Hildy made this and the following red hot quilts for her neighbor's lucky grandchildren! 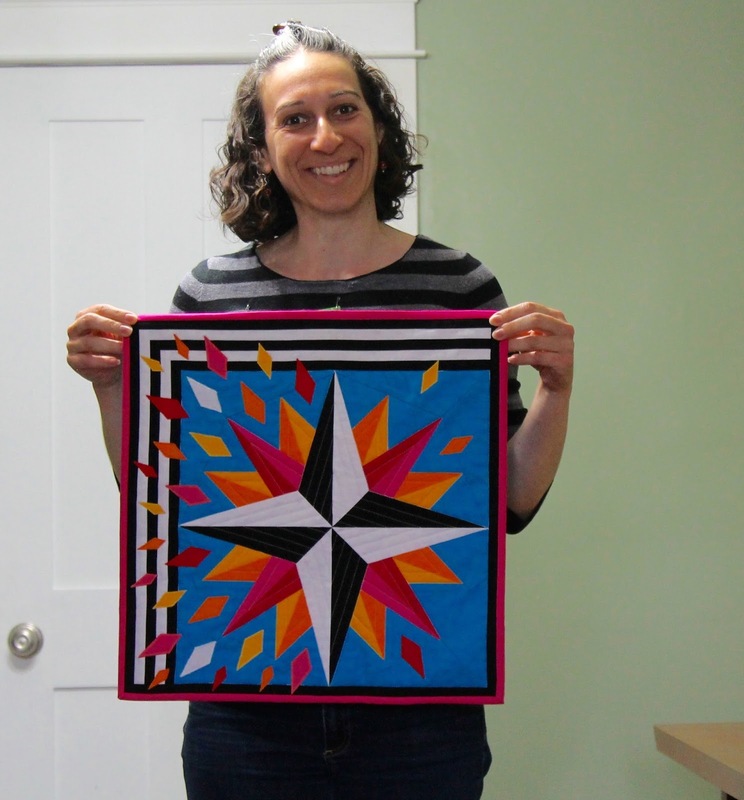 Rebecca's two-tone Mariner's Compass is inspiring a set of placemats! 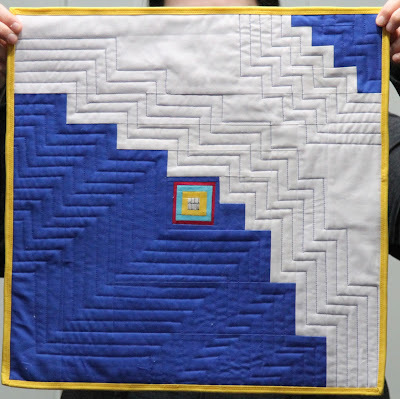 Lots of ohs and ahs for this blue wonder of Rebecca's designed with three sizes of log cabins. 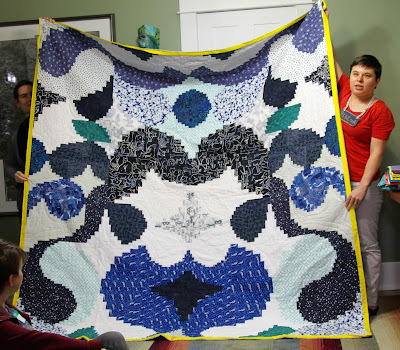 Do you see the seahorse made out of seahorse fabric at the bottom? but now it's been beautifully hand quilted by her mother! 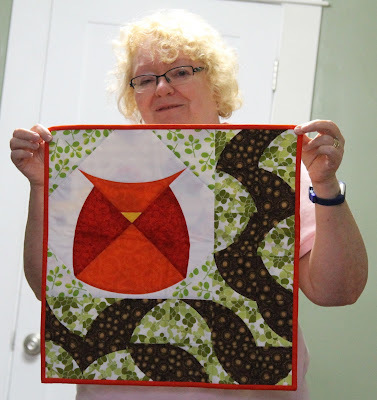 Chris's clever drunkard's path owl, complete with drunkard's path branches! 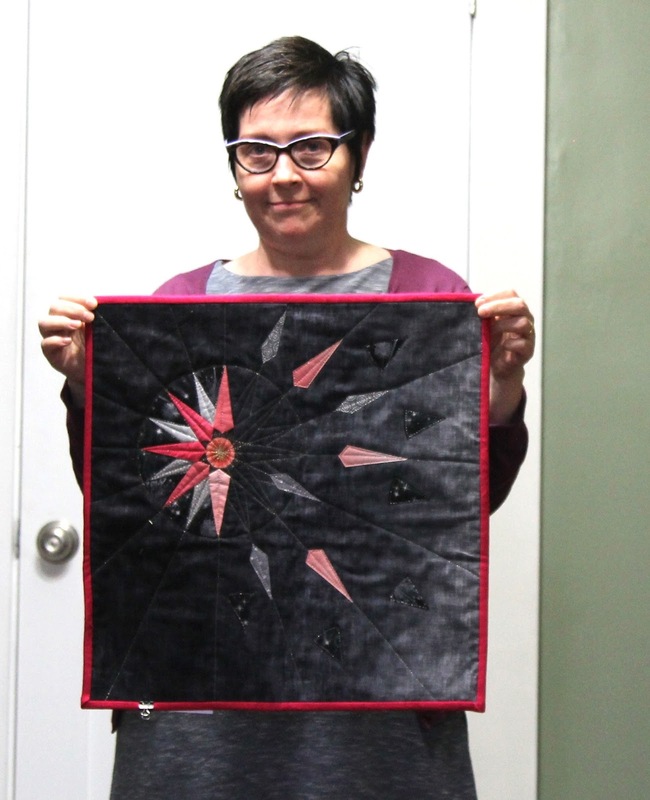 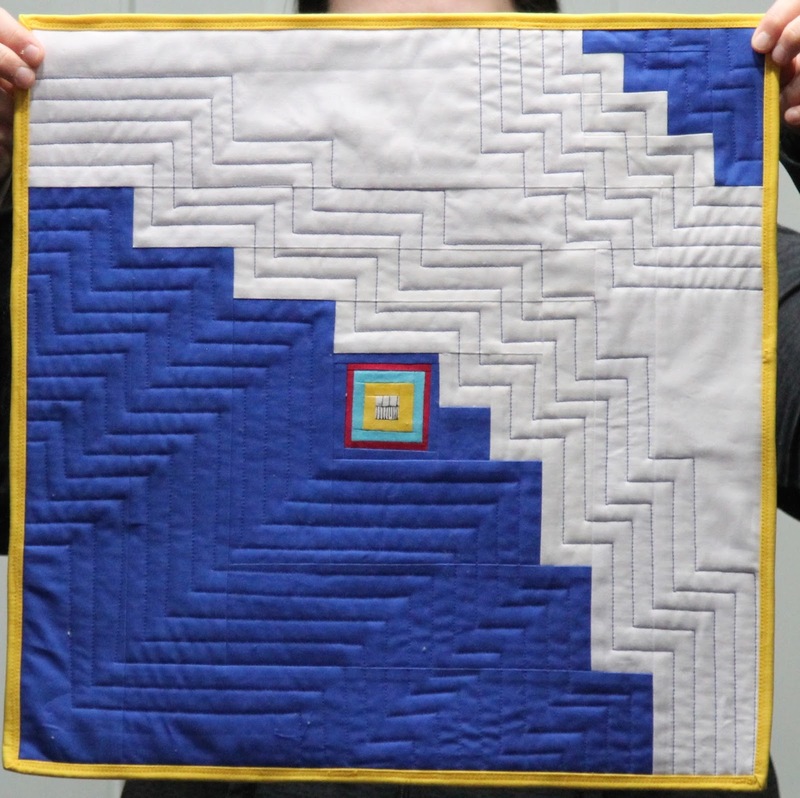 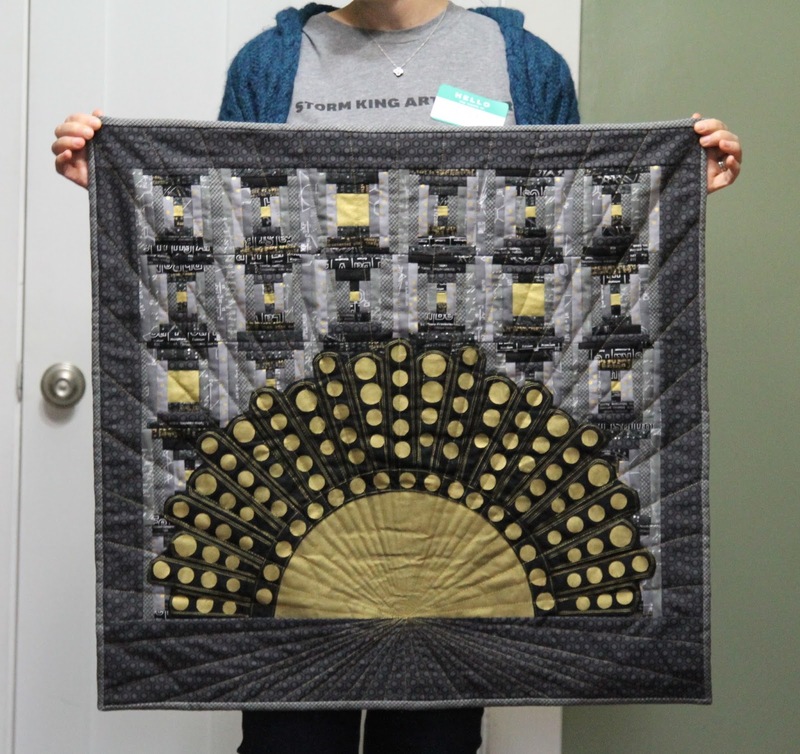 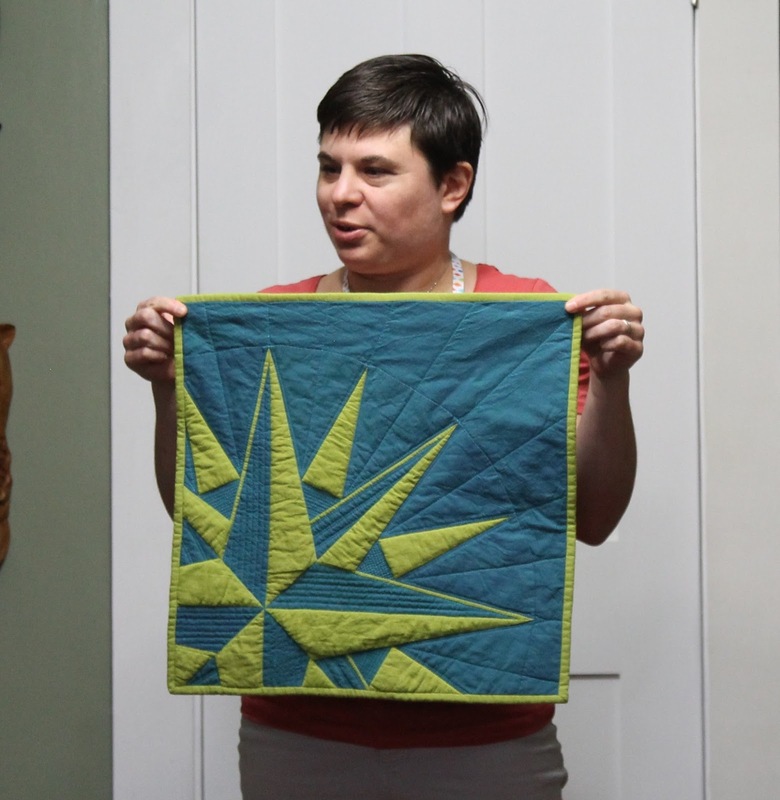 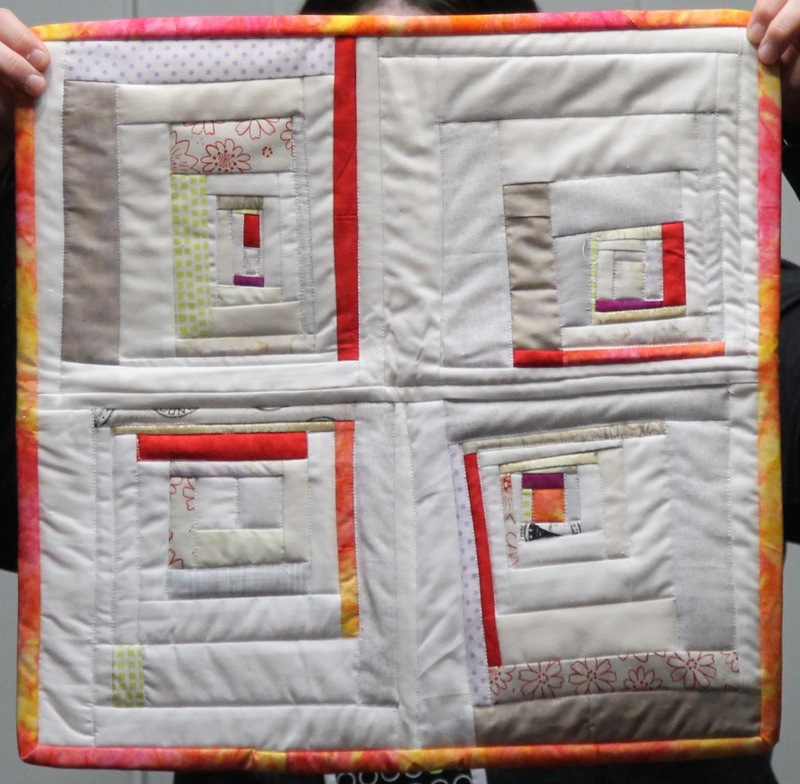 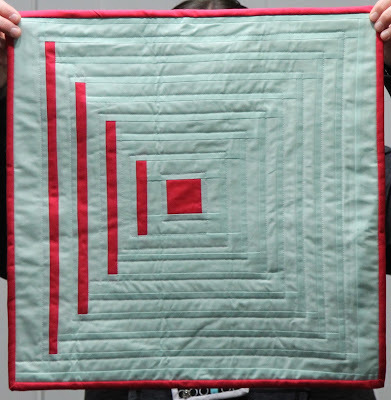 Julie's "This One's for the Lawyers" quilt, inspired by Ruth Bader Ginsburg's Dissent Collar. Sue's seasonally-spot-on drunkard's path tulip with interesting background repeats. Kathy's mini-mariner's compass, with beautiful feather-like spikes. the lines on Kim's flying geese. 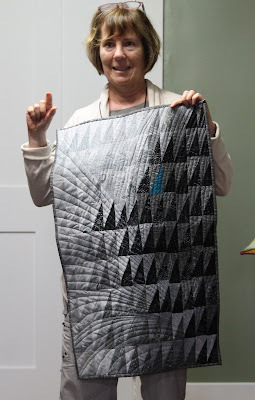 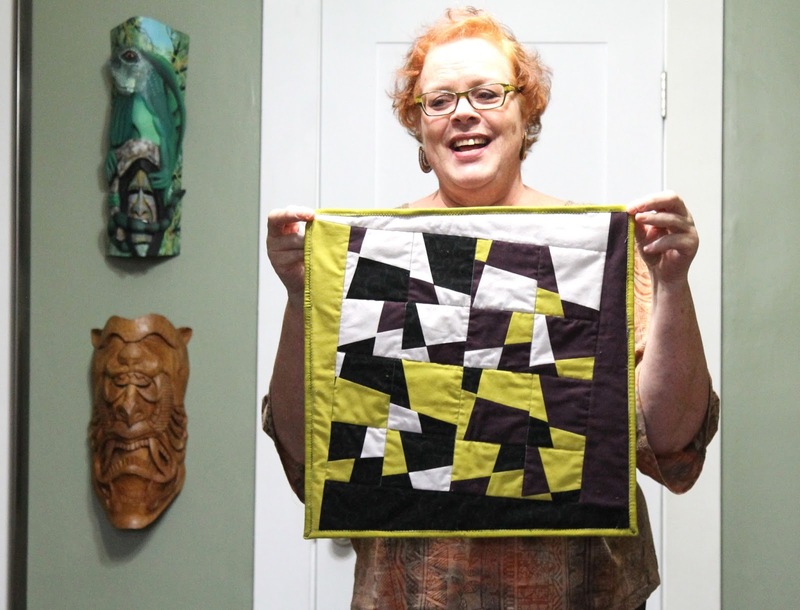 Kim's black and white scrap quilt made from the scraps of a different project! 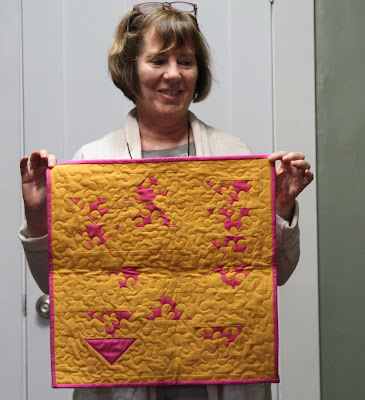 Christine's modern take on flying geese played with fun colors and fabrics. Jessica's neo 9 patch made with fabrics from retreat! 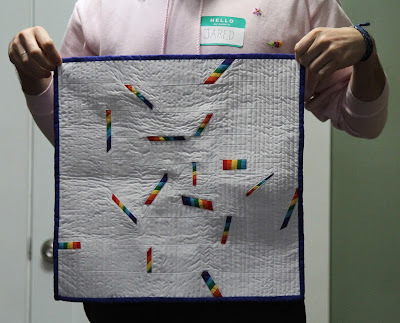 Jared's clever creation, where there is just one rainbow per log cabin piece. 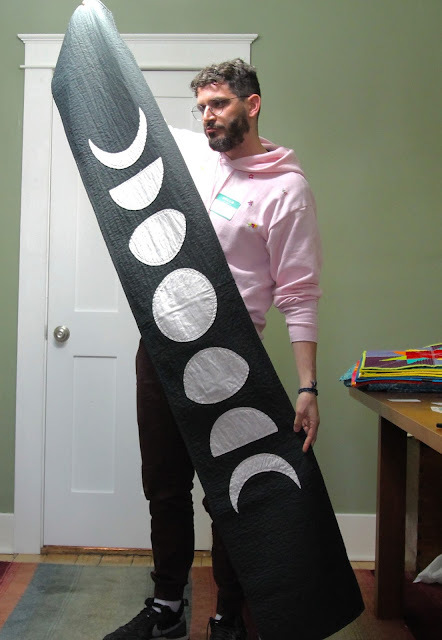 Jared's cool moon phase banner, his first raw edge applique project. 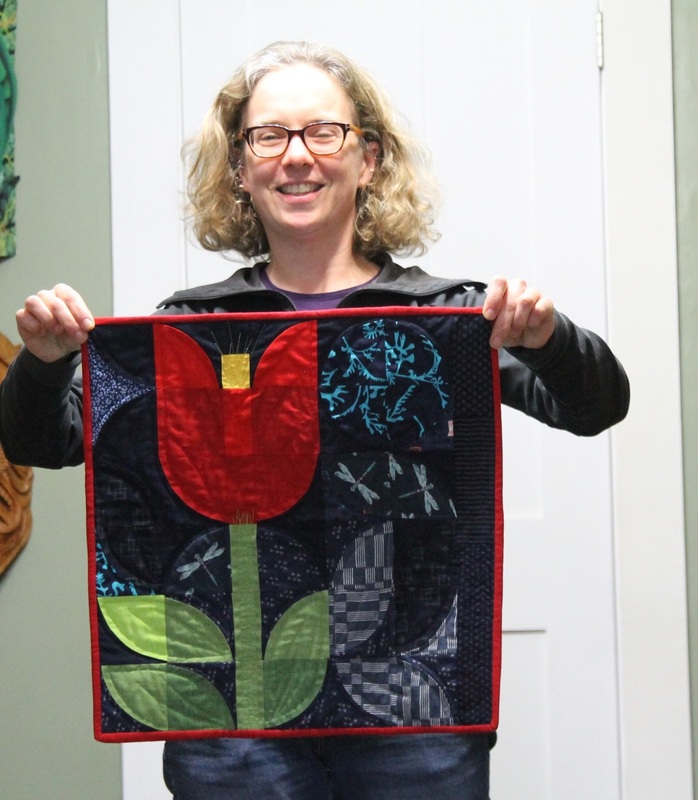 And note the hand embroidered flowers on his sweatshirt as you'll likely see more over the coming months! 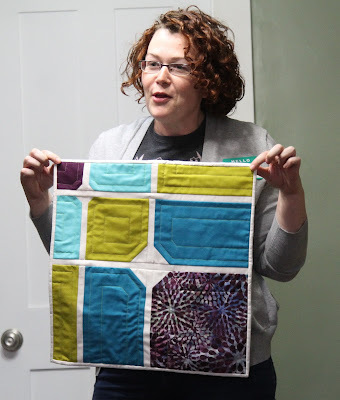 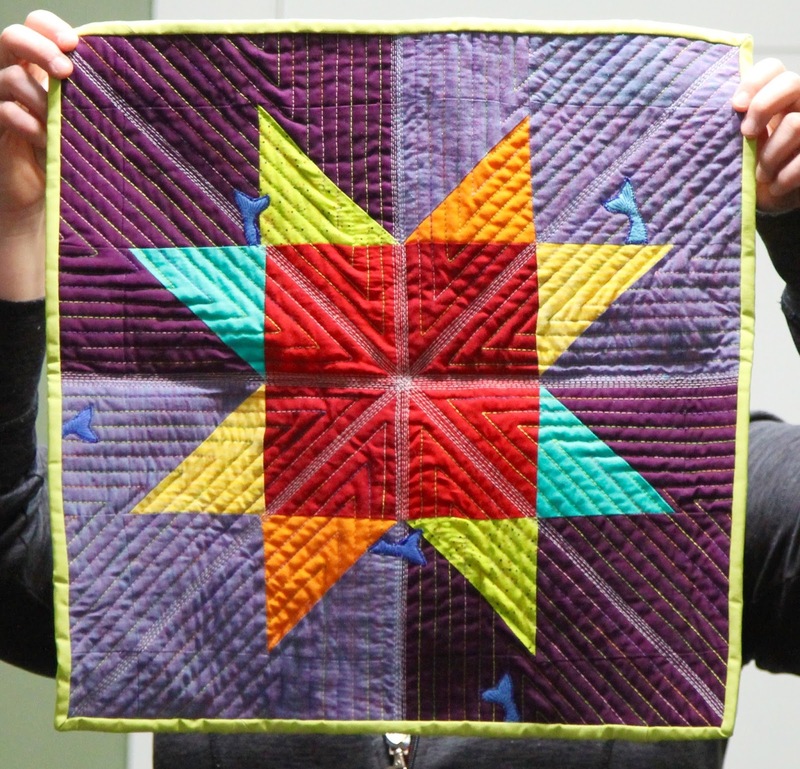 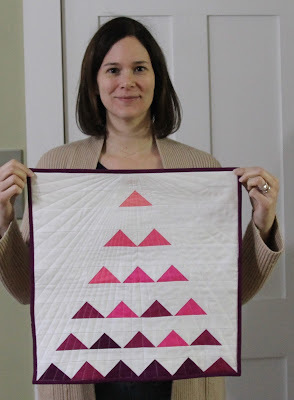 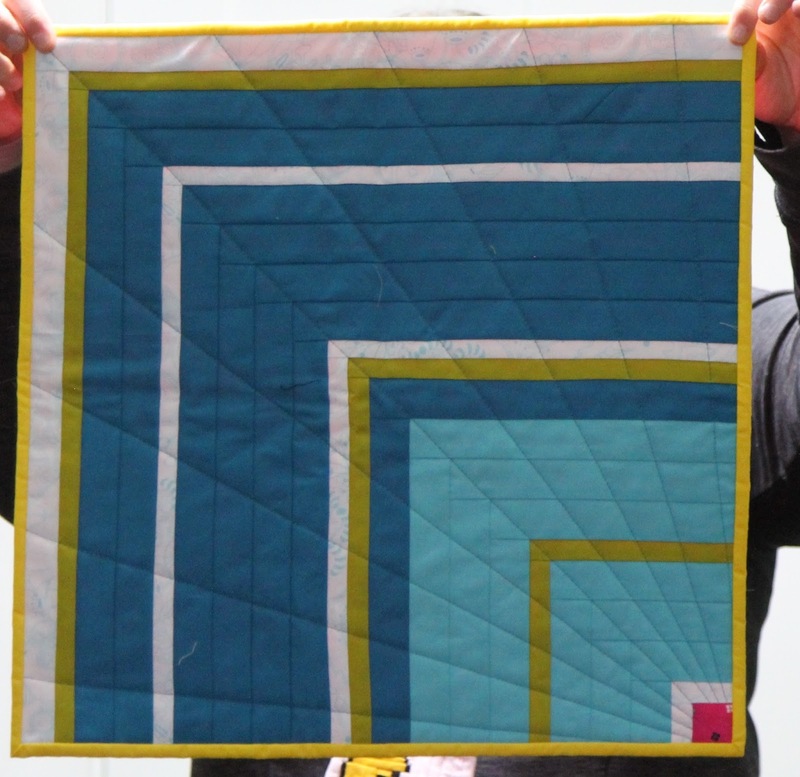 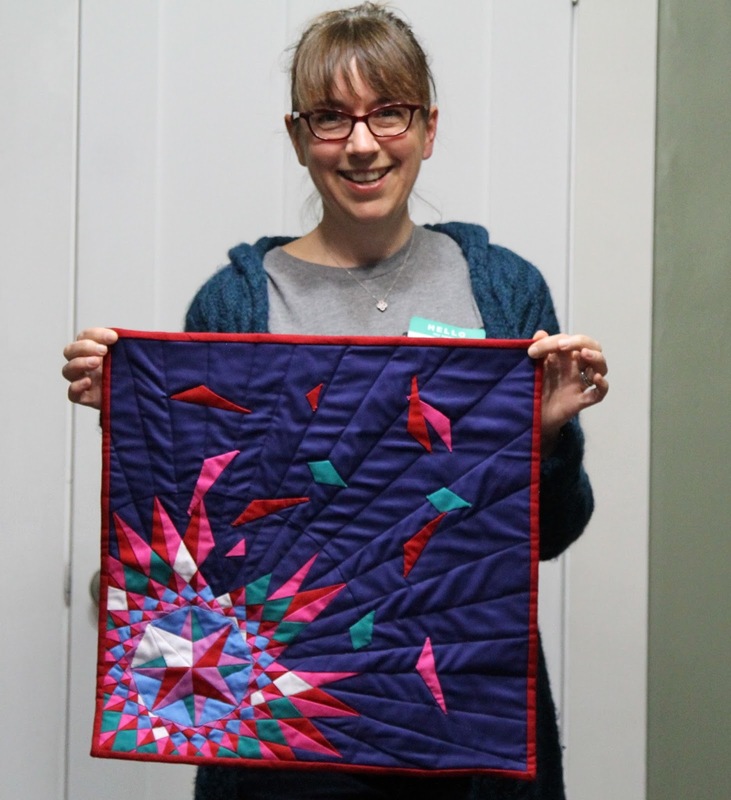 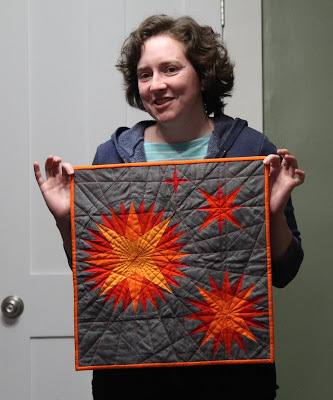 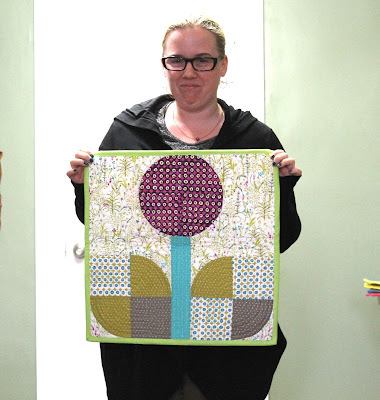 Heather's mini with the color contrasts, size variation and creative quilting hitting all the right spots! 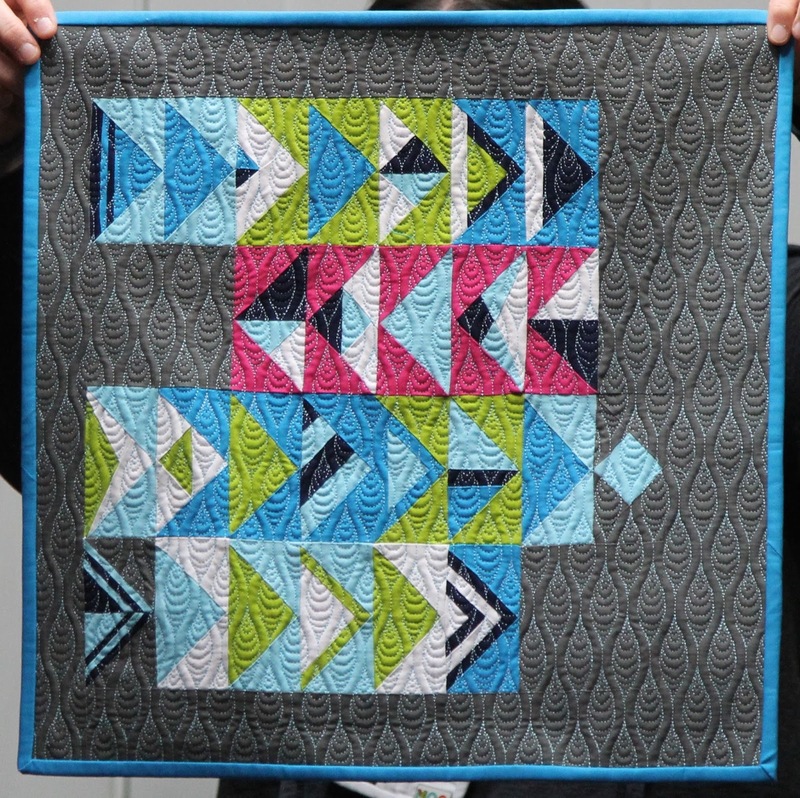 Lovely color and quilting choices on Jordan's flying geese. 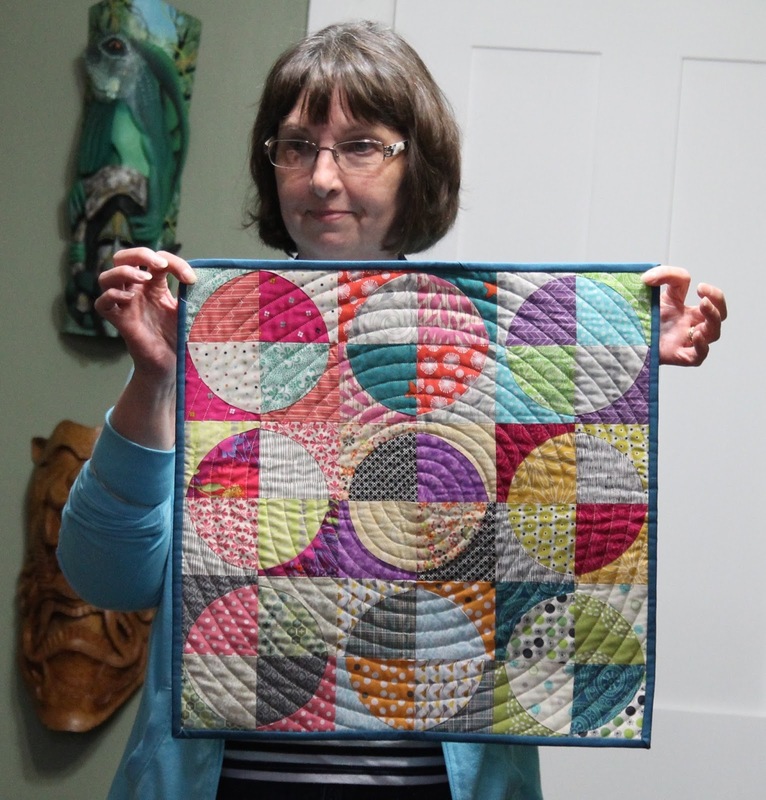 Jane playing with drunkard's path, we were in awe of her circular quilting - she credits a Christa Watson tutorial. 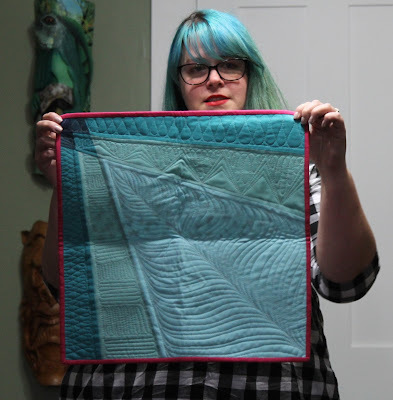 Charlotte's lively mariner's compass included itty-bitty mermaid tails! 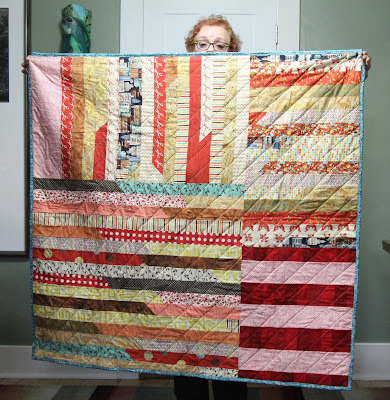 and Kaesmene's bluesy log cabin! Gwen's flying geese also had amazing quilting - that's not patterned fabric! Ali's vibrant log cabin surrounding an actual log cabin! 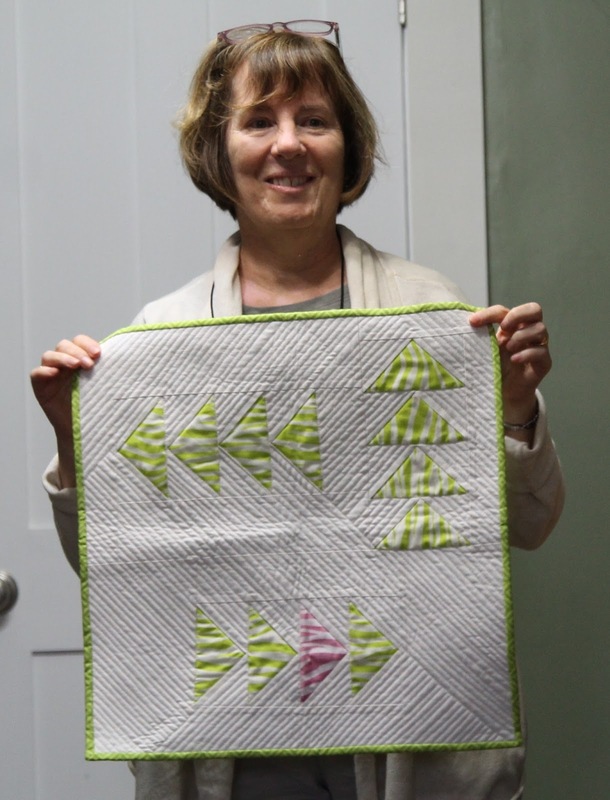 Laurie's spiral of flying geese may have been hard, but it was worth it! 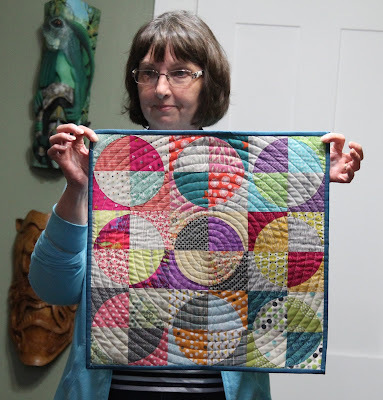 Come see them all in person this weekend as part of Cambridge Open Studios. 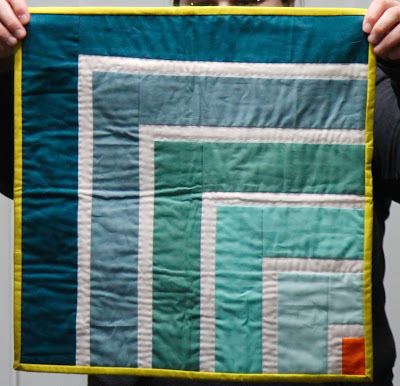 If you can't make it, we'll see you all at the end of the month back at Gather Here. 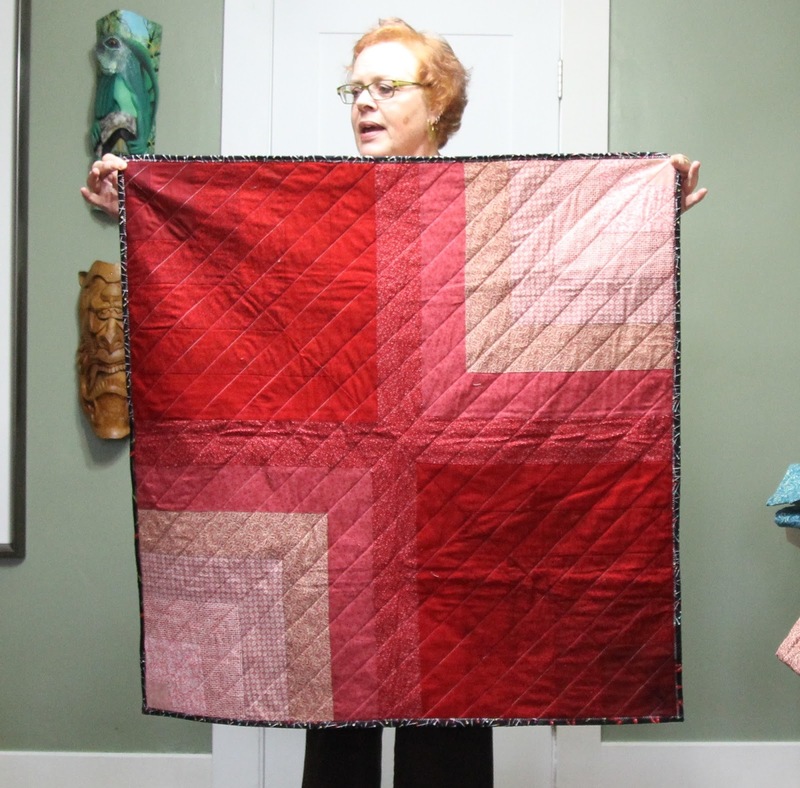 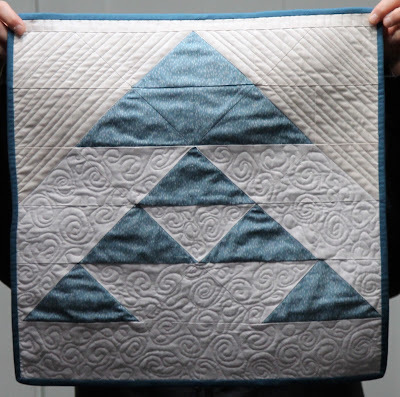 Get quilting!